I don't know about anywhere else in the world but Twitter seems to be going through the roof here in the UK. You go on the radio and someone is talking about twitter or they are getting comments from it, TV shows are talking about, newspapers etc. 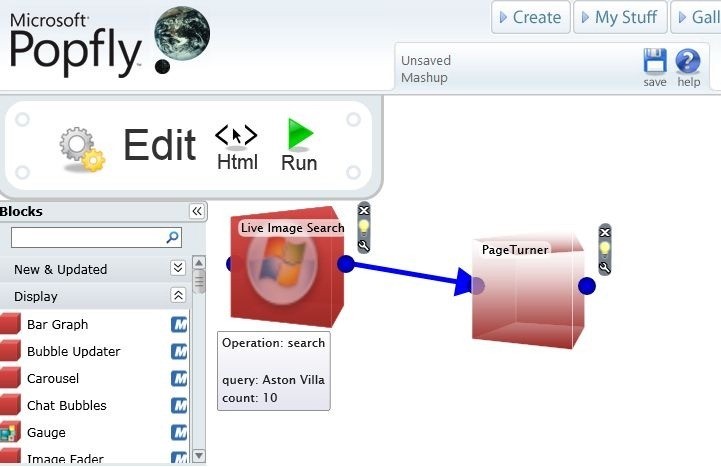 Microsoft Popfly is a great way to create a mashup – taking a source of information and publishing it in a great graphical view. 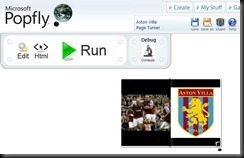 As an example here I have taken my favourite football team(soccer for you Americans ;-), Aston Villa, searched Live Images and published all the images it finds into a page turner. There are some many different blocks you can use now in Popfly – you should really give it a go if you haven’t already. 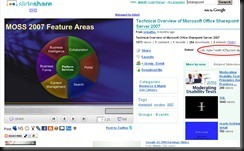 So how do we get this onto our SharePoint page. Well its easy as the others really. 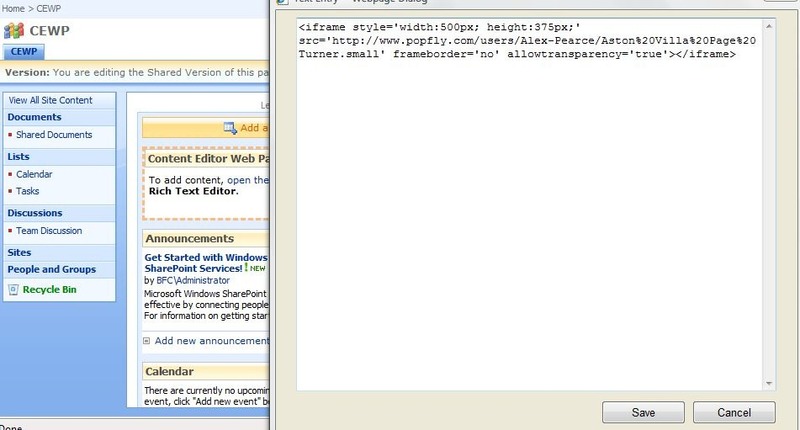 As per YouTube and SlideShare, Popfly gives you the embed code to add to any kind of website. 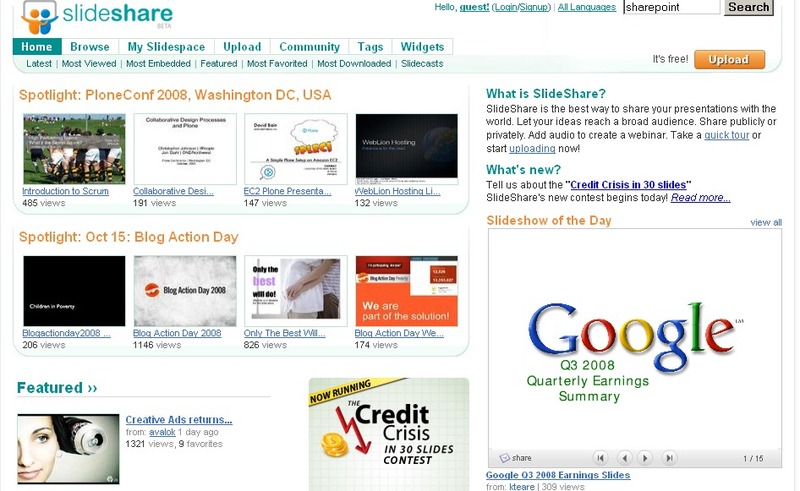 I got introduced to slideshare.net this week which is a great way of sharing your presentation with the world. 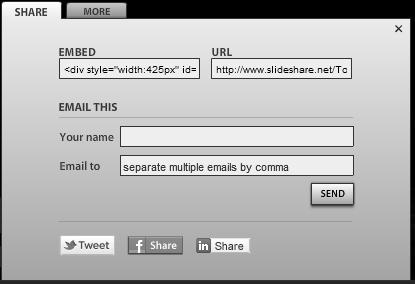 You can upload your presentation and make the available only to yourself through your login or through the public domain. 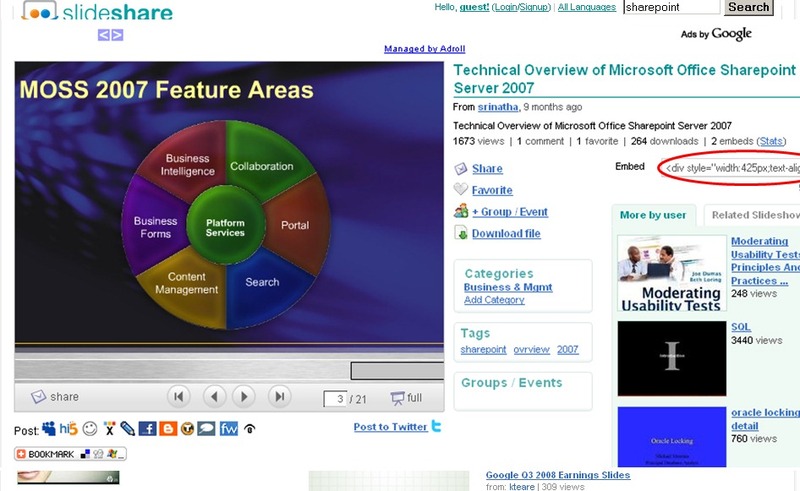 When you’ve uploaded your presentation you can view your slides in the same size as a YouTube video but you have the option of making it full screen. You don’t get any kind of animation, all you get are still frames of the slide. This could be a great way to keep a back up of your slides online and also sharing them with the general public. 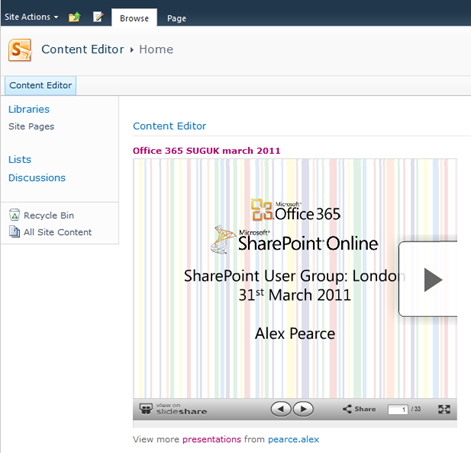 Getting your slideshare presentation in SharePoint is the same process getting a YouTube video. We are going to paste this code into the Source Editor with in the Content Editor Web Part. 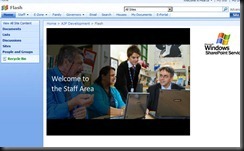 Now click on OK and Ok again and you will see your slides on your SharePoint site. 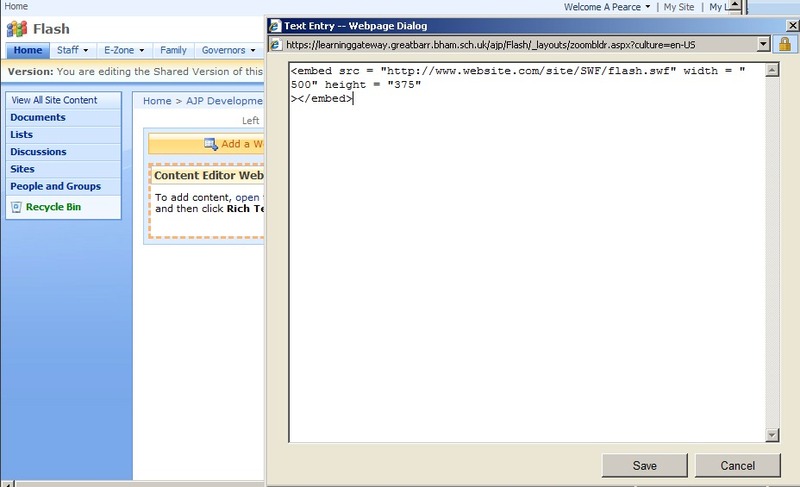 In part 2 of Using the Content Editor WebPart I want to talk about how you can integrate a Flash file into your site. 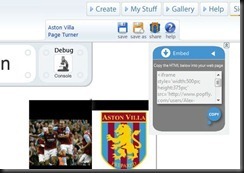 We’ve all seen flash before and we all know that you can create some great animations. 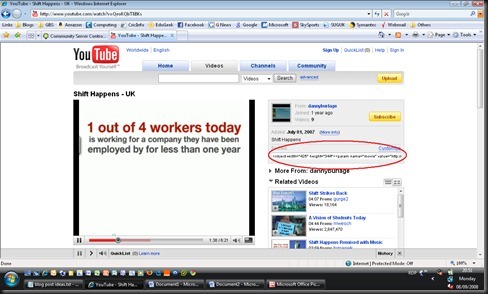 If you look around the internet many websites use flash for animations. 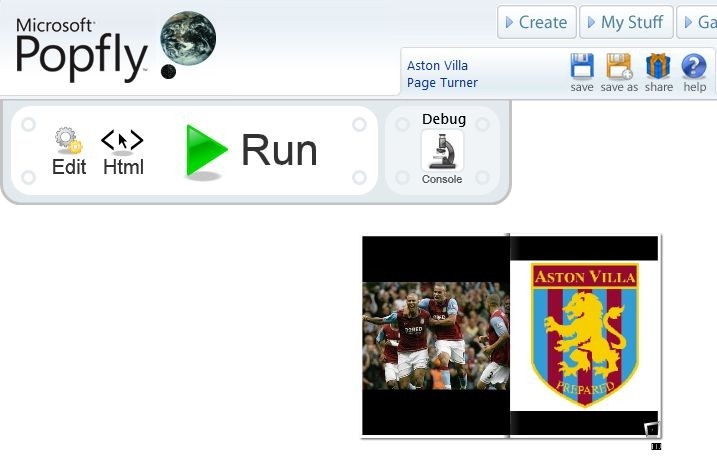 Some companies such as the BBC and SkySport have streamed videos through flash and YouTube using flash videos to stream their videos. 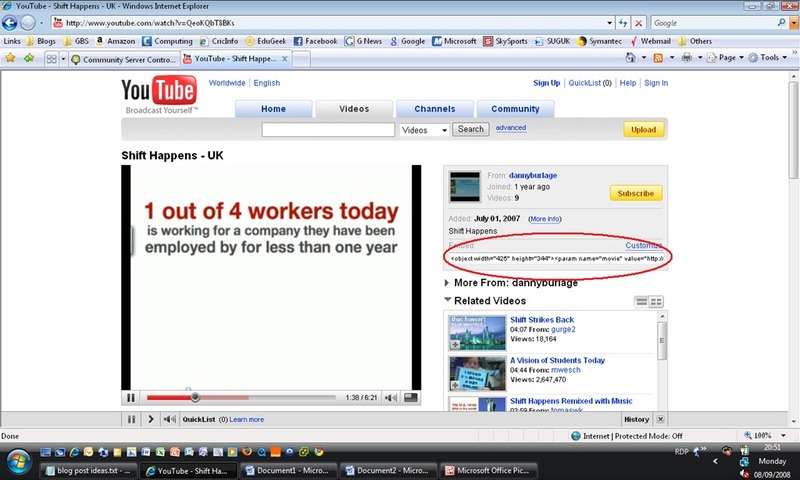 Many sites that have banner advertising, also user adverts that are now in SWF/flash format. 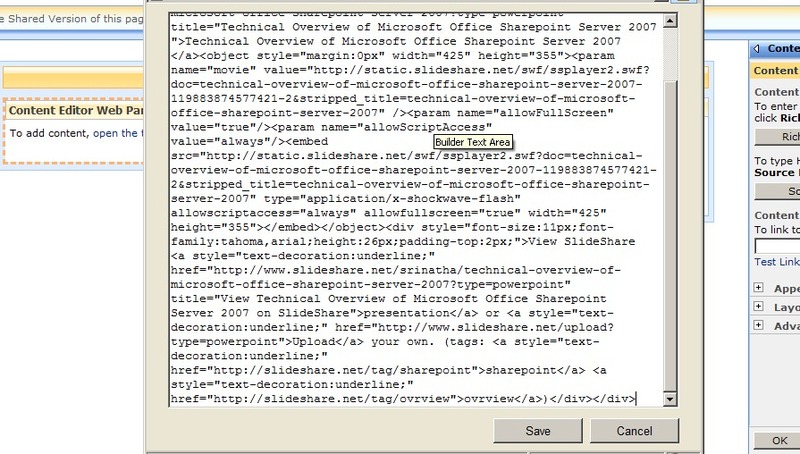 So lets add a flash file (.swf) to run on the front page of our SharePoint Site. 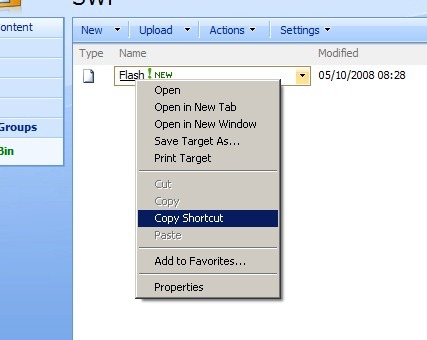 We first need to upload the swf file into a document library. 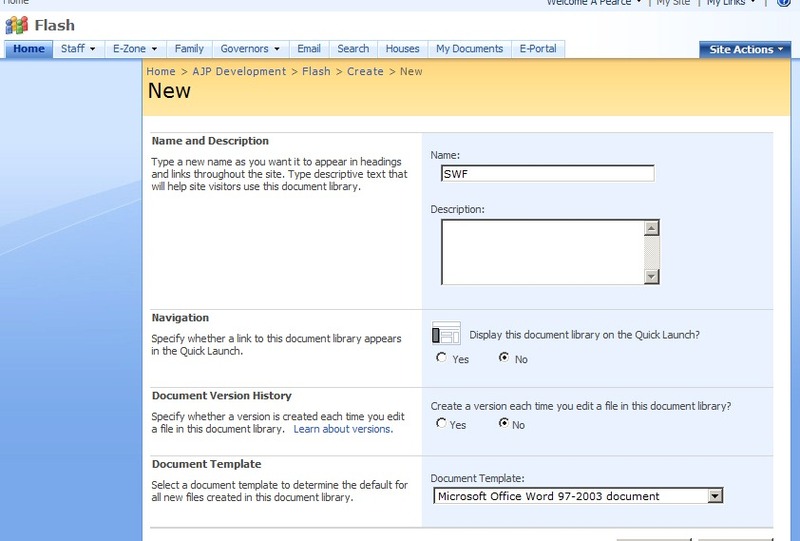 Create yourself a document library. 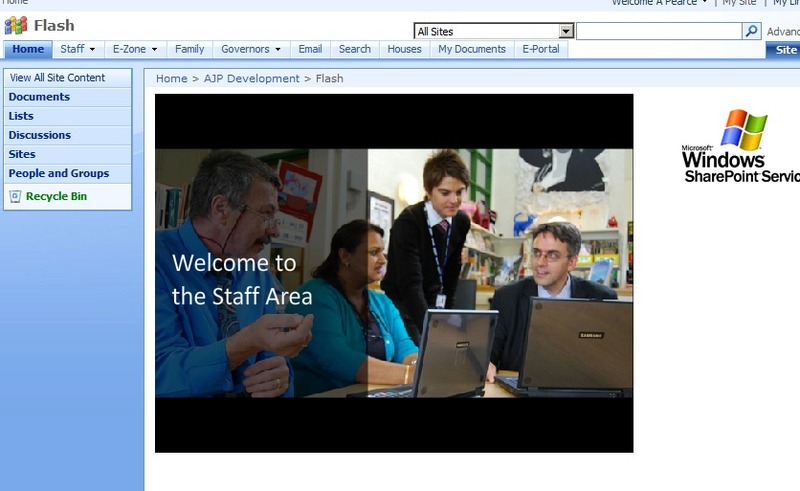 You might want to tell the document library to be hidden from the Quick Launch bar down the left hand side so visitors/members of your site can’t easily find the library. 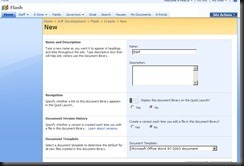 Go to Site Action – Create and under Libraries click on Document Library. Give your Document Library a name. I’m going to call mine SWF. 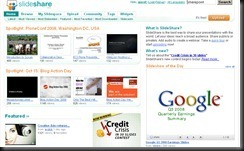 Under Navigation, click No which will hide the library from the left hand side navigation. 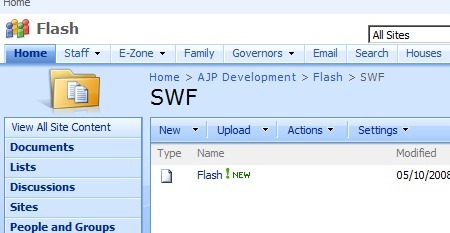 I’m now going to upload my SWF file into the library and anything else that might be required for the flash file to run. At this point we need to find out the URL of the SWF file as we need it later. Right click on your flash file. You will see your standard Internet Explorer properties and we need to copy the URL. 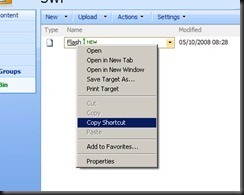 Click on Copy Shortcut and it will add the URL to your clipboard. Paste this into Notepad or Word for reference later on. 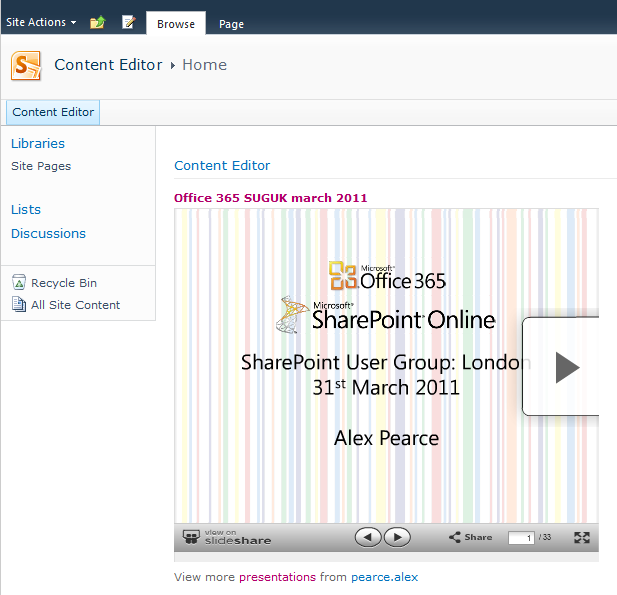 We now need to add the Content Editor Web Part to our site. 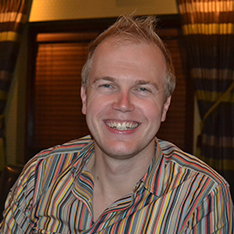 Go back to the top of your Site and click on Site Actions, Edit Page and then Add a Web Part. 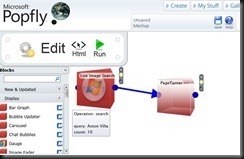 Find the Content Editor Web Part and add it to your site. 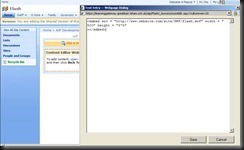 Click Edit on the webpart and then into Modify Shared Web Part. If we have a quick look at the code here you will see three main areas. 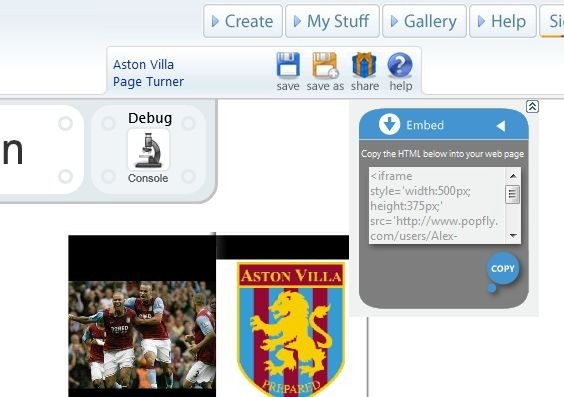 We now need to add the code to the content editor web part. Before we click save and finish we need to tell the code where to pull the SWF file from. We copied it earlier, so we’ll now paste the URL of the SWF file in the code after src =. Click Save and you’ll have your flash running in the page.